The theme editor is where you can change up the look of your website. If you want to change the content for the various pages on your site, you will need to switch over to the 'Page Editor'. To quickly switch to the page editor while in the theme editor, click 'Page' in the top left hand corner of the page. To read more about the 'Page Editor', click HERE. While we offer different themes that you can choose from, keep in mind that each theme can be customized a great deal. 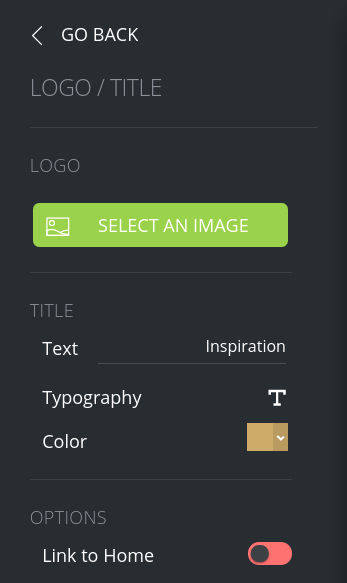 To access the theme editor in order to make changes to a theme, select the one you want to edit while in the 'Themes' section of your account and click 'Edit Theme'. This section will allow you to add a logo, add a custom title (and adjust the font, color, etc. for the title), and add a link for the title text. The 'Colors' tab lets you change the background color for your site, as well as adjust the 'Palette Colors' for the entire theme. 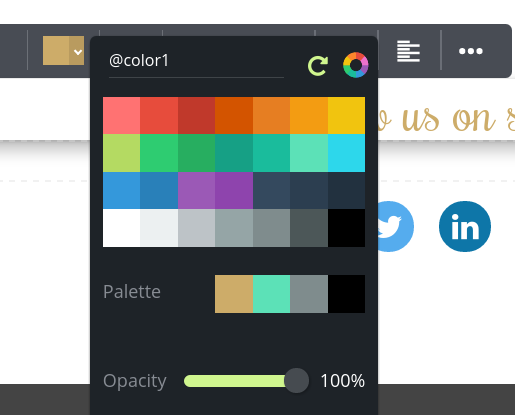 The 'Palette Colors' are a group of colors that will be shown throughout the rest of the page and theme editors so you can quickly and easily select them. For example, if you're in the page editor and want to change the color for a text block, you can select the text block and click 'Edit'. From there, click the color drop down menu and a box will pop up allowing you to change the color for the text. By default, the 'Color Palette' colors you chose in your theme will show up. From here, you can change the font type and size for the various text on your site. You'll notice when you make changes to a section, the changes will be immediately displayed in the theme preview within the editor. For example, if you change the font type for the 'Normal Text', you can see where the changes will be applied in the preview on the right. As you can probably guess, the header section provides you with ways to customize the header of your website. From here, you can add a custom background image, make changes to the site's navigation menu (where your site's pages will be listed in the header), and adjust the 'Info Bar' (the bar at the top of the header). This section allows you to change the color scheme and add or remove the SnapPages branding at the bottom of your site. Additionally, you can add blocks to the footer (Text, Image, Button, etc.) by clicking 'Add Block'. The advanced tab provides additional customization options for your theme. To access these features, you will need to upgrade to the 'Advanced' account. Let us know if you need any help upgrading, or have any questions about what is included in this type of account. If you need help with anything that wasn't covered here, or if you have any additional questions about the theme editor, please let us know.